These are days of great tension and mobilization in the Susa valley where for two decades citizens are strongly engaged in the defense of their territory against the High Speed Train (TAV) project, a useless, costly and socially and environmentally devastating development project. There is already a train-line Lyon to Turin. This would be another one. The No Tav opposition movement suffers criminalization and militarization which repeatedly violates the Susa valley’s citizens’ rights to disapproval and to democratic participation in the decisions regarding their lives and their territory, while their struggle is stigmatized by the media. Politicians remained deaf to the citizens to whom they should be accountable for in the first place. 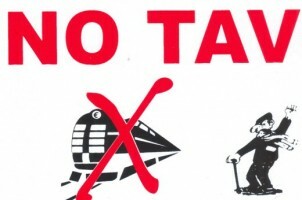 Notwithstanding, the No Tav movement has carried on for years its struggle to promote a development model that differs from the imposition of a destructive and un-necessary mega project. Italy cannot pay its debts and nevertheless the TAV line goes on. The tension recently grew again to stop the destruction of the landscape and the properties of local people. A strong mobilisation continues now for one week. The latest tragic episode has jeopardised the life of Luca Abbà, a local activist and farmer, engaged for years in the No Tav movement, now hospitalized in critical conditions after falling from a high voltage pylon during a police raid on 27th February. The struggle of the people of the Susa valley is of fundamental value to us all. It is a struggle for civilization that speaks not only about the future of one of the most beautiful valleys of Italy, but about the future Italians want for their country. It speaks about which priorities to pursue in Europe: those of an entire local community that defends its collective welfare and its territory or those of mega projects and contractor companies’ interests. For years, the struggle of the Susa valley people has been an example of struggle for the defense of common goods without surrendering to criminalization, manipulations and media attacks. Today more than ever, Susa Valley citizens needs to be supported in their call to halt to the construction works and give up the TAV project. The article “Stop that train! : Ideological Conflict and the TAV” will soon be published in the special issue “Transport Economics and the Environment” of the journal “Economics and Policy of Energy and the Environment”, based on A Sud case study “High Speed Transport Infrastructure (TAV) in Italy” developed for the CEECEC project.